Having a private cinema in your home was once considered the ultimate luxury, available only to movie moguls, film stars, and industry titans with access to restricted film libraries. 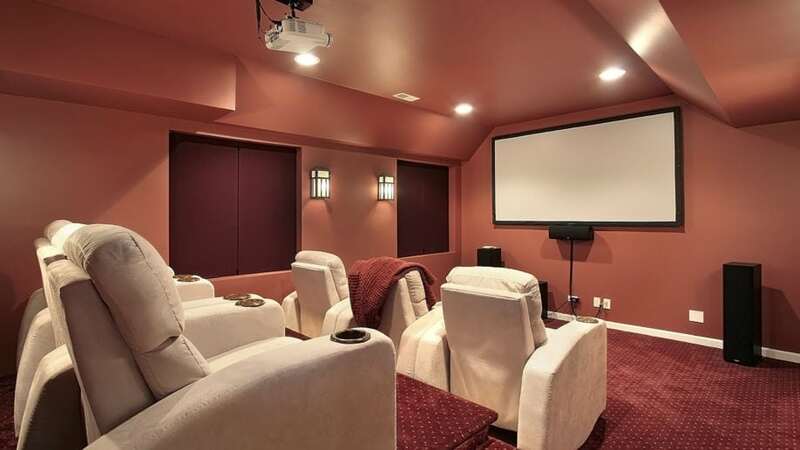 Joseph Cali, a theater designer and installer for actors George Clooney, Matt Damon, and Tom Cruise, estimates that the minimum cost for a top-of-the-line home theater is upwards of $500,000 — and it can reach millions of dollars depending on amenities. While such extravagance is beyond the desires and checkbooks of most people, advances in technology have expanded opportunities for middle-income Americans to enjoy the experience of a private video and audio entertainment space. Today, private media rooms are designed and constructed to replicate the experience of viewing movies and TV shows in a commercial theater in a smaller, more comfortable environment. Most have viewing screens of 16 to 18 feet long with elaborate sound systems and comfortable seating. If you have gamers in your family, a media room can also enable them to play their video games on the big screen. Is it time for you to consider adding a media room to your home? Let’s take a look at what it entails and how to decide if it’s right for you. The decision to add a media room is rarely based on financial benefits, such as its expected financial return when the house is sold. While these things are a consideration, the real benefit of a media room is the pleasure that you and your family will receive from it. Of course, this can be difficult, if not impossible, to quantify. A four-member family spends almost 1,785 hours annually watching television; is the additional comfort and control of a home media room worth $1 per hour or $5? It’s hard to say for sure. What we do know is that for most people, viewing films, playing video games, or listening to music is more pleasurable in their own homes than in a public venue. Poll after poll indicates that the majority of Americans prefer video entertainment in their homes due to their control over the following factors. A home media room allows the viewer to pick what to watch and when to watch it, including giving them the ability to pause content for bathroom breaks or rewind if they missed something. The plethora of available content providers means that viewers can select from a wide variety of content, including old and new domestic and foreign films, TV shows, sporting events, and documentaries.